Leveraging the February 2016 Super Bowl 50 frenzy, Pantene and DeVries Global released the Dad-Do video series days before the big game. The image of a burly football player braiding his daughter’s hair isn’t just adorable, it’s also a way to start a conversation about strong women and father-daughter relationships. For this effort, which was a continuation of the P&G brand’s 2015 Strong is Beautiful campaign, the team looked at how to incorporate a dad-daughter relationship into a routine that worked with Pantene’s products. It landed on morning hairstyling. 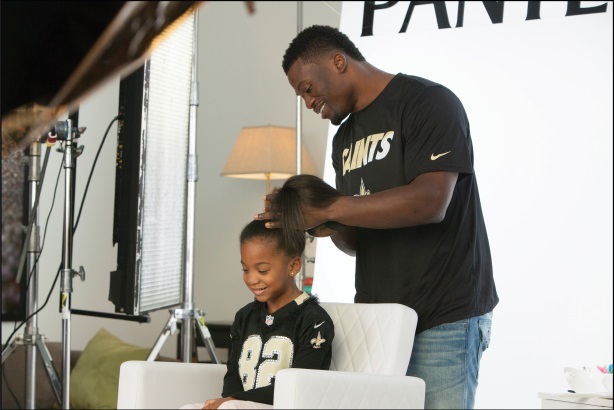 Videos challenged football dads to create fun hairstyles for their daughters using Pantene products, but mostly highlighted sweet conversation and bonding time. Leveraging the February 2016 Super Bowl 50 frenzy, Pantene and DeVries Global released the Dad-Do video series days before the big game. The videos featured football players — including DeAngelo Williams of the Pittsburgh Steelers — styling their young daughters’ hair. Judges praised campaign research. One judge called it a "savvy use of gender to highlight a female product." Pantene included insights from a study showing how girls with supportive fathers grow up to be strong women. The study highlighted their high levels of self-reliance, psychological well-being, confidence, and educational and economic prowess. "This is an example of how to incorporate research into an idea with mass appeal," another judge added. "Not only did it generate talk, but it also inspired conversation." And generate talk it did. The series of videos was the most successful launch in Pantene’s history, with 45 million views and 250 million social media impressions. Fathers began using #DadDo to post similar videos. That same hashtag trended on Facebook for 48 hours. Despite not running a Super Bowl ad, Dad-Do was named one of the top commercials from the game and was subsequently featured in a wide range of media outlets. After Excedrin maker GlaxoSmithKline found that 88% of migraine sufferers feel misunderstood by friends and family, Excedrin and Weber Shandwick created The Migraine Experience. The campaign tapped into augmented reality to show such symptoms as visual auras, light and sound sen­si­tivity, and dizziness. The Migraine Experience was released as a video series and a downloadable app, so migraine sufferers could help others understand migraines. As a result, sales for Excedrin Migraine rose 15% from the previous year.